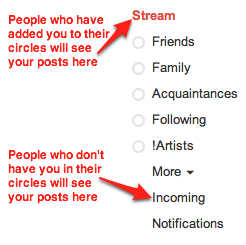 Here's a quick cheat sheet to help you decide who should see your posts. If someone doesn't have you in their circles, your posts to them will be shown in their incoming stream (see second screenshot). If you want to get their attention, +NAME them in a post and they will get a notification. Tip for advanced users: If someone reshares something you've posted to Extended Circles, they will not be able to reshare it to public. The only options available would be specific circles/individuals, all circles, and Extended Circles. 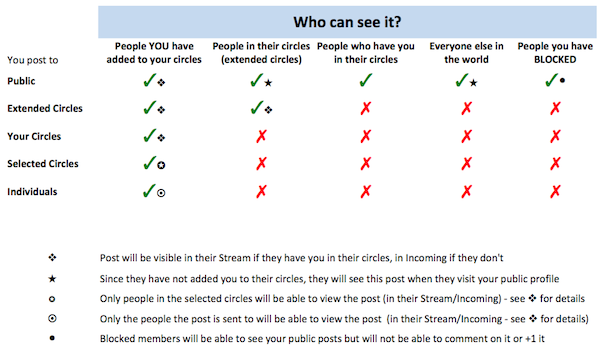 So if you want to make it easier for your posts to be reshared, post to Public instead of Extended Circles.